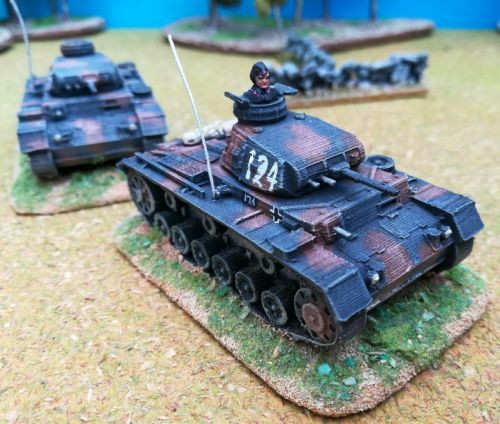 I find myself thinking about getting an additional 2-4 panzer IIIs to fight a larger action, but all my 10th Panzer IIIs are the Matchbox kit (i have 10), I bought the Armourfast 2 in a box kit, but frankly they are pretty poor (and big). Does anyone happen to know if the Italeri 2 in a box Panzer III looks OK next to an old Matchbox III?? Same question as to the PSC kits? Whilst we`re here I assume the Revell IIIL is just the repackaged matchbox kit - is this correct?? Sorry, Richard, I thought so but no - it is a rebox of the old Ausf M kit and has the hard plastic build up fiddly tracks. First review gives a comparison with the revell kit.